Arrange 6 ramekins or small bowls on a rimmed baking sheet and set aside. Add the butter to a medium, heavy bottomed saucepan. Heat on medium melting the butter and swirling the pan occasionally. Cook until the butter begins to brown and has a nutty aroma. Add the brown sugar and stir until the sugar is dissolved and the butter begins to foam. Slowly add the half and half, stirring constantly. The butterscotch may size and harden, but just keep stirring as it will melt as the half and half warms. Add the vanilla bean seeds, the vanilla bean pod and salt. Bring the mixture to a simmer and remove from the heat. Remove the vanilla bean pod and stir in the bourbon, set aside. In a medium bowl combine the egg yolks, 2 tablespoons granulated sugar and the cornstarch. Whisk until the mixture is smooth and bright in color. Gradually drizzle in some of the hot butterscotch mixture , whisking constantly to temper the eggs. Pour the tempered egg mixture back into the saucepan whisking constantly until combined. Place the saucepan back on the heat and warm the mixture until it bubbles a few times and starts to ticket - 3 to 4 minutes. Carefully blend the hot pudding with a stick or immersion blender or a regular blender if needed. Take care if using a stand-up blender as the heat will built up so leave a opening at the top to vent the steam. Blend until the mixture is silky smooth. Divide the pudding between the prepared ramekins and refrigerate until cold (3-4 hours) or overnight. Cover loosely with plastic wrap if storing overnight but wait until it is completely cooled so condensation does not form on the inside. Before serving allow the pudding to sit at room temperature 15-30 minutes. To prepare the bourbon whipped cream, beat the cream on high using a hand mixer until it thickens. Add the sugar and beat until soft peaks form. Gently add the bourbon and mix on low speed just until blended. 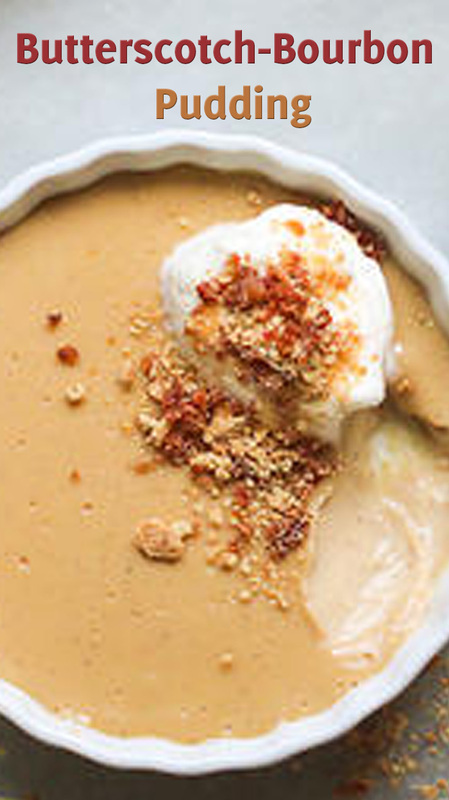 Serve topped with crushed gingersnap cookies if desired.